Where do old buoys go to die - the buoy boneyard. 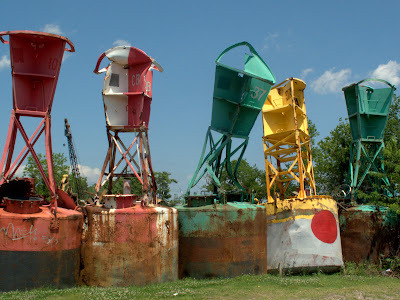 These are a few of a row of 15 old navigation buoys forming a fence along the 23rd Street side of the L. Chenman scrap metal yard in Norfolk Virginia. Canon G10, 1/400 sec at f/8.0, ISO 100, 16mm equivalent focal length.